It was just getting gray light, and I had been settled in my stand only a few minutes. As I stood in my loc on, I surveyed the area around me, making mental notes of distances and shooting lanes. I turned to my weak side and made an attempt to draw my bow, and my elbow caught my safety tether. I hung my bow up and turned towards the white oak I was in to adjust the height of my safety rope, and that’s when I saw it. 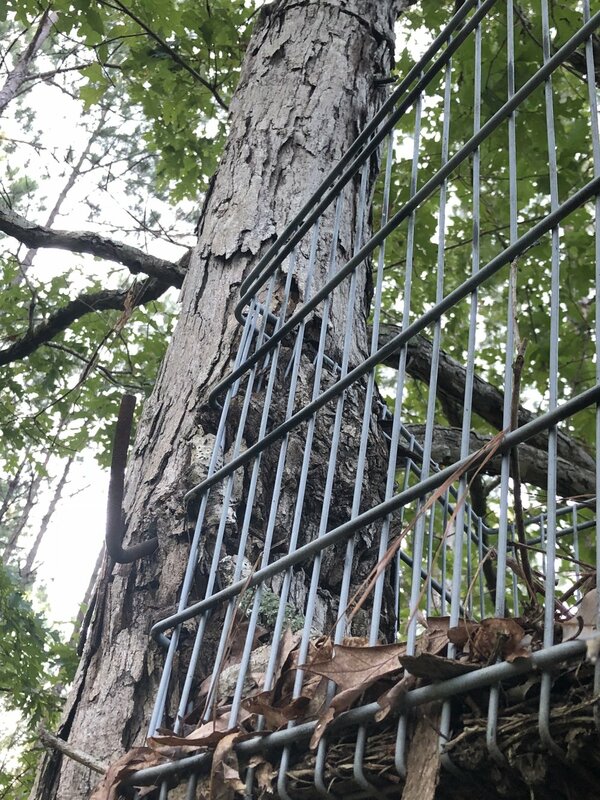 About 6 feet above my head was a shopping cart, which at some earlier point in time, had been wedged between this split white oak. 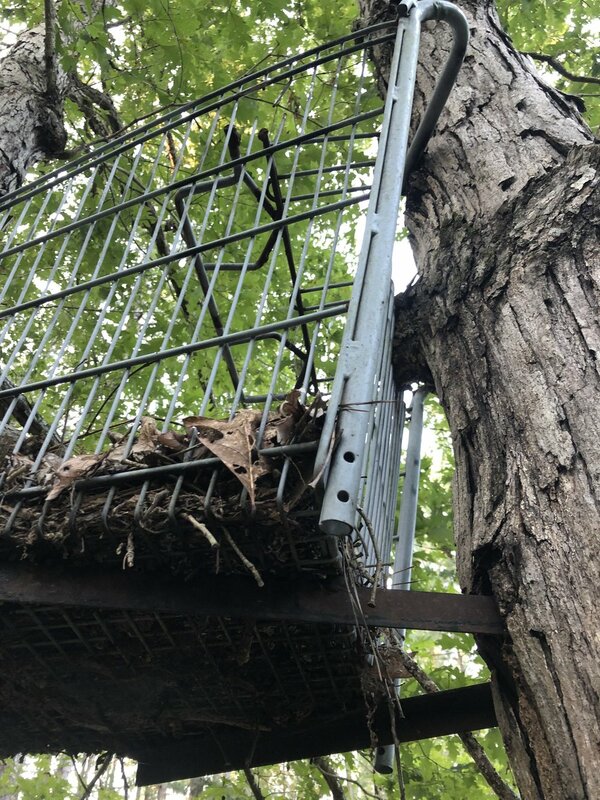 Bars had been welded to each end to help secure it to the tree, but had long since grown into the tree. I stared in awe at the contraption, wondering how I had missed it just days earlier while I was scouting this ridge. A big grin crept over my face, and I thought about all of the old stands I had seen over the years hunting public and private lands. A mixture of ingenuity, resourcefulness, and some, just pure death traps. One thing was for certain, they always seemed to be found in good hunting spots. A white oak acorn bailed from its perch, and smacked the ground loudly in agreement. Just 15 yards to my left was the only white oak acorn tree on the entire ridge that was dropping. 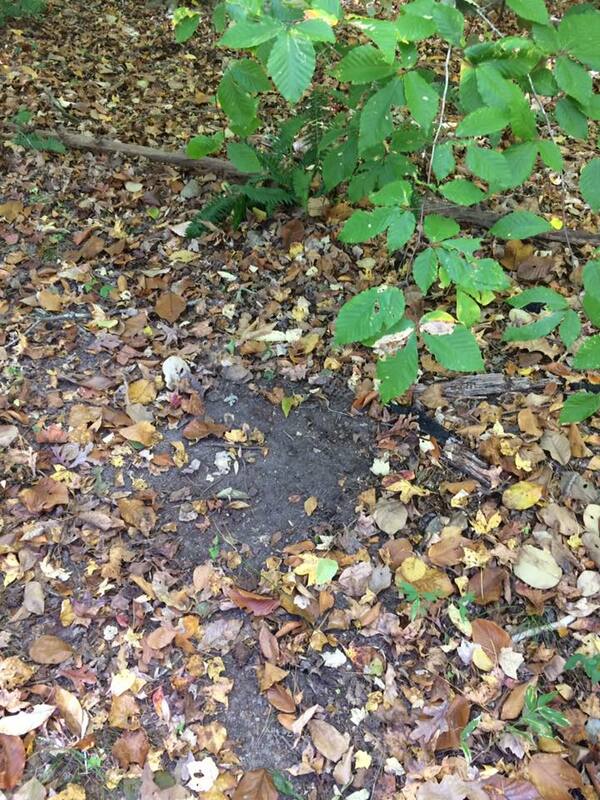 There were deer tracks, turkey feathers, and the ground beneath tree was visibly disturbed. I’d grown up hunting feed trees. Everything from persimmons to mast trees. I’d learned over the years, which trees dropped first, and which trees seemed to be favored by the deer. I never worried much about he rut, my strategy had always been does and food, and the bucks would generally show up. This season, the mast crop had been a bust in the area I had been hunting, and I was struggling to find deer in early October. This had forced me to scout some pretty remote ridges in search of a hot feed tree. Now, as I sat in my stand listening to the acorns drop, I couldn’t help but muse at the idea that I was going grocery shopping, and I had my own grocery cart. About 8am, I caught movement up the ridge about 50 yards away. I stood slowly, folding my seat up against the tree with one hand, and reaching for my bow with the other. I turned my body slightly, as to angle my front shoulder towards the dropping white oak. A few minutes later, the young buck was standing at 12 yards. He came in nose to the ground, and I could hear him sniffing loudly trying to find the freshly dropped acorns. I had a small hole to shoot through, and I quietly shifted my feet to get ready for the shot. As I did, a piece of bark from my tree fell and hit the ground. The buck looked right at me, staring intently. I froze and didn’t look him in the eye. A moment later he put his head back down and continued feeding, confident I was no threat. I came to full draw, paused for a moment, and let the arrow fly. The deer turned and ran up the hill, stopped at 50 yards, and laid down. Public land, a 40 year old recurve, and a trophy…. I couldn’t stop smiling as I guided the deer down off of the steep ridge to the bottom. Last season, I had committed the entire season to ground hunting. It was a great challenge, and I had so many close calls it was ridiculous. However, I did not kill a deer, and had gone full year with no venison to eat. This season was my first year using a loc on stand and climbing sticks. I had found a hot acorn tree, walked in, hung my stand, and killed a deer. However the work was just beginning, as I was a long ways from the truck. I had several ridges to cross that were very steep, and rose to 450 ft of elevation. I rigged up my backcountry hoist, which gives me a 2:1 mechanical advantage. I’ve had some back problems over the years, and I have found it much more comfortable to hoist my deer up to quarter them. This hoist system saves my back…. I made short work of quartering the deer, carefully placing each cut of meat into my meat bag. I could already smell the shoulder roast. I packed everything on to my eberlestock f1 mainframe. This little pack had been fantastic for everything from scouting, hauling my stand and sticks, and now carrying my meat out of the woods. It was a long walk back to the truck. I stopped to rest several times as i hauled the 40 pound pack up the steep ridges and back the jeep. As I broke from the forrest onto the service road, I was tired and thirsty. I made it to the jeep, where I knew a cold bottle of water awaited me. I sat on the back , and took a long pull on the bottle. I was so proud of myself. It had been one of my most memorable hunts, and it was time to head home, and unload the groceries. The silence in the room could have cracked an anvil. Where there should have been pulsing sounds that represented life, hope, and happiness, there was only cold, dark, silence. I couldn’t move, and I couldn’t breathe. I was staring at the screen unable to comprehend what I was seeing. I was unable to interpret the sound of silence. It was then that I heard my wife say, “There’s no heart beat…”, in broken quiet voice. I turned to embrace her, as hot tears began to flow down her face. As healthcare providers, both of us had been around personal loss. We had helped guide others through the grief, anger, and acceptance of the loss of a loved one. Nothing had prepared us for the loss of our third child. Just days before we had reveled his gender to our family through our boys shooting blue, paint filled balloons with their little long bows. Everyone was so excited about the addition of another baby boy to our family. Now we were sitting in the parking lot of the doctors office, holding each other and crying. For the next week, I didn’t have time to think about it much. I was busy getting the boys to school, homework done, and bathed and in the bed, all the while taking care of my wife who had, had surgery and lost a lot of blood. On top of that , she was deeply sad, and I didn’t know how to fix that. All we knew to do was to hold on to our faith, and hold on to one another. Although we were in pain, we understood that our baby never belonged to us, and that one day we would see him again. I never cried in those first few weeks. I kept feeling like I should, but the tears never came. I had begun work on a bamboo backed hickory bow for the upcoming season. The physical work of shaping, sanding, and tillering my first bow helped occupy my mind. One afternoon, as I was working, I noticed my boys bows hanging on the wall. I thought about how far they had each come. How their forms were improving, and how they were able to hit those balloons filled with blue paint. In that moment, I realized that I would never get the chance to do that with my third son. Tears began to roll down my face, and for the first time I sobbed deeply. Everyones reaction to loss is different. For me, it made me realize how thankful I was for what I did have. It caused me to feel the love I had for my family and friends, in a way I had never experienced before. It made me realize that I needed people. I needed human connection. I needed a group of people who would share with me in everything. I needed a “tribe”. I began to think about life in a different context. I saw for the first time, though I had heard it often over the years, that this grand experience we call life, was meant to be shared. All of it. The joy, the pain, the good, and the bad. As I did the final sanding on my new bow, It occurred to me that every good bow needs a good name. I picked up the pen, and I carefully wrote, “Cohen”. I knew that he had a father in heaven that was watching over him now, but somehow, I thought by carrying that bow with his name on it, maybe i’d be sharing my adventures with him. Maybe instead of holding his little hand, as we walk through the forrest searching out wonderful adventures, I could hold onto to this long bow for now. I spend a lot of time in high stress situations. It’s part of my job and my training. This was different. I tried to hang my bow back up, but missed the branch several times because my hands were shaking. I felt weak. I was straining to listen for the buck to crash, but I couldn’t hear anything but the sound of my own heartbeat. I sat down and tried to gather my thoughts. It was around 5:30, so I still had an hour of light. I knew I had made a fatal shot on him, but I wanted to give him time. I checked my watch again, and began pulling up the paracord rope to lower my bow. I figured by the time I got down , I’d be good to take up the trail. That’s when it hit me. It was one of those moments where stark realization just crushes you flat. “What trail?”, I said aloud. I collapsed with my back against the tree. After a few moments with my head between my knees, I raised me head and stared up towards where I had shot the buck. The deer was dead, but my chances of finding him were slim. The entrance wound was high on his back, and with no low exit wound, it was likely there would be no blood trail. I lowered my head again, asking for help from the only source I knew could aid me at this point. I finished my prayer, grabbed my pack and my bow, and set off with long strides towards the creek below me. I’ve always kind of prided myself on my ability to find animals. Over the years, I’d recovered a lot of deer my friends, and hunt club buddies couldn’t find. I’m no master tracker by a long shot, but I was confident that if there was any sign, I had the skills and experience to find this deer. At least, that’s what I told myself as I walked towards where I’d seen him disappear into the trees. It was easy to see where he’d crossed the creek and scrambled up the bank, but after that my fears were quickly affirmed. The easiest path was an old logging road that wound around the hill up towards the pines where he’d been bedding this summer. I was losing light now. I grabbed my phone and text my long time friend Chad. Lucky for me he wasn’t working, and agreed to meet me and help me look. I met him at the Forrest service road, and he opened the back of his truck to reveal a pelican case containing an infrared camera. We exchanged greetings and I told him what had happened. He patted my shoulder and assured me that this camera could see him through the brush, and he was sure we could find him. Hours later, we stood in the same spot at his truck, cold, tired, and defeated. The only thing we had found was an armadillo. Six weeks later, after an uneventful morning hunt, I was showing my friend Nathan where all of this had taken place. We were walking down through the drain, scouting as we went along, and recounting stories from our youth. These were the same woods we had learned to hunt together in as teenagers. I pushed back the canes along the edge of the creek, and that's when I found him. I was elated, and horrified all in he same moment. I looked up, and about 100 yards away, through the now thinning leaves, I could see my hillside pine tree that I had been in that day. I turned to Nathan and said, "It's him....". "He died within sight of my tree," my voice trailed off. I reached down and wrapped my hand around the tall, dark antlers. I was deeply saddened that I'd taken his life, and his body had gone to waste. Not in the sense that he had been wasted, as nothing in nature truly goes to waste, but that I hadn't gotten to feed my family with my kill. I realized then, that the buck had taken a trail to the right of the old logging road, and down into the thick canes next to the creek. I had simply turned the wrong way when trailing him. I thought about doing a skull mount of my buck. In the end, I decided I didn't deserve it. I chose instead to fashion things from his antlers that would remind me of his story. I made a file handle for sharpening broadheads, that I might remember that they always needed to be razor sharp. I made limb bolts from his antler bases for my bow, so he would be with me when I hunted, reminding to make the best shot I'm capable of. Finally, I plan to make a knife with an antler handle to carry, in hopes that my future hunts may have a better outcome. Mid october found me perched in a saddle between two ridges that descended into a swamp bottom. I had been staying close to a group of does that had thus far managed to elude me. There were multiple trails leading out of the swamp and up the ridges where the deer were cleaning up this years mast crop. There was buck sign everywhere along the bottoms and ridge tops. My plan was to stay close to the does in hopes of taking one of them, or any buck that came sniffing around. It was a warm, bright afternoon and I was sweating from the walk in and the climb up into my tree. I was in a pine that was flanked on each side by two young white oaks. One thing I had learned this season was hunting higher in the tree reduced my chances at a broadside shot. Ideally, I wanted my shot at around 15 yards, and at my old compound stand height, the angle was just way too steep. Hunting lower meant that my scent was lower, and I was closer to the deer's line of sight. I had already been picked off a couple of times earlier in the season, so now I was looking for stand trees with more cover. Since this was public land, I used a climber to stay mobile, but it limited the trees I could get into. I found at times I didn't have a good stand choice where I really wanted to hunt. I trimmed a small limb to my left, and used it to hang my bow. A few other limbs were in the way and I quietly made small cuts to bend them over, opening up space to shoot but maintaining as much cover as possible. The sun was hot, and I took a long draw from my water, pulled my hat down low over my eyes and settled in to wait. The sun finally dipped below the tree line, and the shadows began to stretch across the landscape. I was standing, slowly scanning the draw below me, when I saw three does making their way up the hill behind me. They passed by me at about 80 yards, browsing their way up towards the hardwoods on top of the hill. I watched them intently, silently praying one would stray within range. They soon disappeared into the thick brush and were out of sight. I turned back to my right and reached again for my water bottle. As I lowered the bottle, I noticed rings in the creek below spreading towards me. I reached for my bow, and shifted my feet so that my bow shoulder was in position to draw. The deer emerged from the low branches that were obscuring my view of the water. I instantly recognized the tall brown tines. It was him. I could feel my heart beat quickening, and I took several deep breaths and tried not to look him in the eye. He stopped just after crossing the creek, and raising his nose into the air, and began to analyze its contents. He moved more quickly then and he covered the last thirty yards before I could blink. He stopped just below my tree, and began rubbing his antlers and forehead on a small sapling leaving his scent behind. He was less than six yards from the base of my tree, and slightly quartering to me. I wanted to draw so badly. I adjusted my grip on my bow, and glanced around me checking the clearance for my bow limbs. It was then that I noticed the scar. High on his shoulder a small area had healed over and left a small patch without hair. Right then, I knew I wasn't going to make that mistake twice. The buck continued to work the small bush, and I could see the bark shavings collecting in the grooves of his antler bases. I could see the whiskers on his face quivering back and forth. His eyes were shining, but still deep and dark. He turned then, and made his way directly under my tree, and then angled away uphill where the does had gone. He stopped at 10 yards, once again checking the wind. His body was quartering away now, but the angle was steep because he so close. I knew if I hit just left of his spine the arrow would exit low behind the far shoulder. I shifted my feet, raised my bow, and came to anchor. I stared at a spot eight inches back from the scar I had given him a few weeks ago. I could see my arrow tip in my peripheral vision, and I released. The arrow hit its mark. The buck jumped forward, looked around, and snorted loudly. The arrow was buried over two thirds of the way into his chest cavity angling down and forward. "He's dead," I whispered. The buck trotted off down the hill making a wide circle and crossing the creek exactly from where he had come. Every year, this time of year, I remember the first time I saw him. I was walking along a drain, scouting a deer trail that traversed a hillside covered in a mixture of white and red oaks. On the other side of the branch, stood a large pine thicket that spanned the hilltop. As I ambled along, looking for the first dropping acorns, I caught movement in my peripheral vision. I froze behind a large white oak. I stared down the hillside at the creek intently, and felt the warm wind on my face from across the hill. I couldn't see the water as the bluff dropped off steeply obscuring my view. Suddenly, I spied his antler tips sticking up above the ditch bank. I watched in awe, as with one swift jump, he silently cleared the ditch. His ears twitched nervously back and forth, trying to determine the source of the sound he'd heard while he was down in the creek getting a cool drink. His antlers were tall and dark, reaching upward and blending with the pines in the background. His shoulder muscles rippled, and he flicked his tail back and forth nervously as he scanned first one direction and then another. I was hidden, and I knew I had the wind. He was about 60 yards away, and I had a front row seat in a show starring the finest public land buck I'd ever seen. As he slowly made his way up the hill into the thicket, I eased down from my crouched position, sitting quietly behind the big oak. This was my first season hunting with traditional gear, and honestly, and in a way, I felt like I was starting over as a bowhunter. 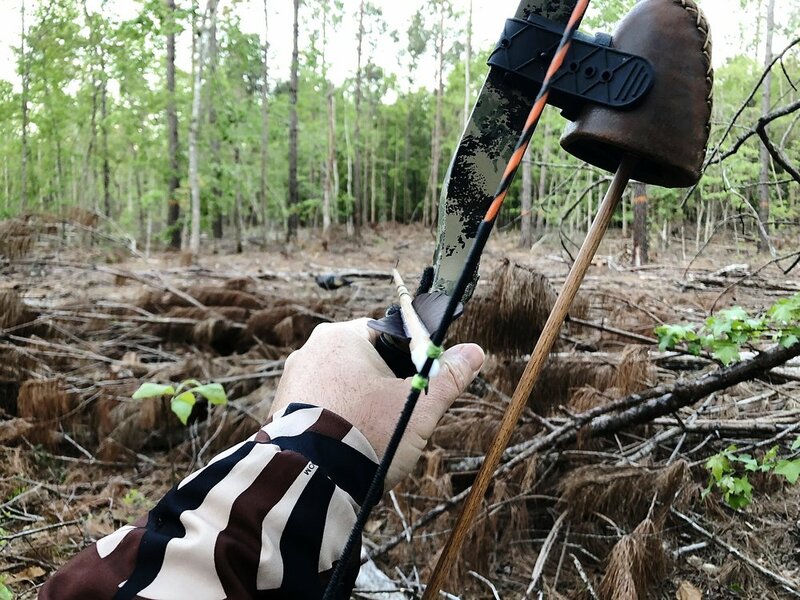 I had just stumbled on to the largest buck I had ever seen on public land, and I was buried in doubts about whether or not I could kill this buck with just a stick and a string. I quietly shut the truck door, shouldered my stand and took a long deep breath. The landscape was changing rapidly and I knew winter was around the corner. The rut was essentially over and I had made a move to hunt the edges of the thickest bedding area I could find. Rifle season on public land drives the deer to deep cover by mid November. All of these things were running through my head as I walked along, sounding like an elephant walking in cornflakes through the fresh blanket of fall leaves. As I approached a drain that made its way down to a beaver pond from the top of the hill I paused. I remembered walking out one night and spotting a doe who had made her way down just at dark. I stood for a minute pondering a change of plans, and then turned and quietly made my way up the drain. Inside the edge of the pines there was a small pocket of red and white oaks that bordered a 2 acre cutover that appeared to be an old loading dock. A well worn trail skirted the edge of the cutover across a saddle and there were several piles of fresh droppings along the way. I chose a white oak 15 yards below the trail. This gave me a good shot from my stand to the edge of the cutover and let my scent blow downhill and out over the beaver pond. I settled in and was sitting quietly for about an hour. The spot was perfect and I couldn't believe I hadn't hunted here before now. I stood looking out over the beaver pond watching the wood ducks feeding and listening to their quiet chatter. I looked back over my right shoulder towards the cutover and there stood 3 does at 50 yards. I never heard a thing. They had slipped up on me silently the way deer often do. They fed along quietly as I retrieved my bow from its hook and slowly got into position. The lead doe was the largest and she was scanning the woods constantly for any sign of trouble. She slowly and methodically made her way down the trail. I checked my shooting stance, made sure my limbs were clear, and pulled slight tension on the string. As she came into range I slowly drew the bow and settled to anchor as the deer paused broadside at 15 yards. That's when it happened. Time just seemed to stop. 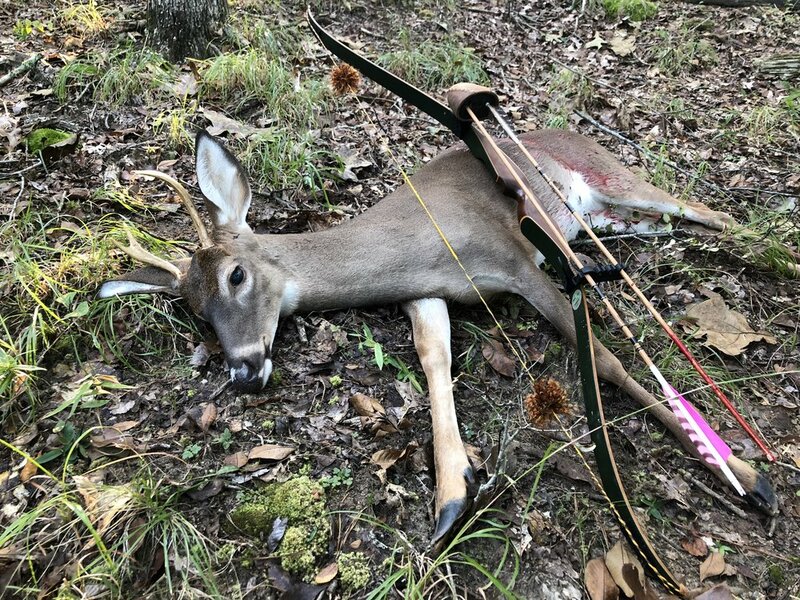 I stared at a spot 2 inches behind her shoulder , saw the arrow spinning in slow motion, and the fletching collapsing as it disappeared through the deers side. The doe jolted forward a few steps and looked around. She walked down the trail about 20 yards bleeding badly from her side. The arrow had passed cleanly through her. She began to get weak and laid down and was soon still. It took me several minutes to realize what had just happened. After a year away from bow hunting, and switching to traditional gear, I had just killed my first deer with a stick and string. I had sent an arrow I built and fletched, a broadhead I had sharpened by hand with a file to its mark. I gathered my things and descended from my perch. I ran my hands over the deers soft coat, placed my bow across her shoulder and took a few photos in the fading light. I have never had a higher moment than that in my time as a bowhunter. In that moment, I found a connection that I had never experienced before. This is what I had been searching for, what had been driving me, since the young boy of 12 picked up his first bow. There was a soft sadness and yet a glowing pride and sense of accomplishment. It felt raw and pure. There was a deep primalness that caused my heart to pound and my hands to shake. I thought back over my journey as a bowhunter. The struggle to learn the craft with no teacher but a few books and magazines. The memory of a 19 year old standing over his first deer after years of mistakes and fruitless seasons. My bowhunting had finally come full circle. It was clear I had screwed up. In the gray of the early morning dawn, the fog was slowly lifting enough for me to see that I was at least 60 yards out of position. The fog had been so thick on the walk in that morning my flashlight was of little use. Now I was settled in my stand and dawn was coming like a train down the tracks. I was frustrated and I knew if I didn't make a move now I would risk blowing my whole morning hunt. A year prior I had decided after months of consideration to give a recurve a try. I had been bowhunting nearly 20 years, but I knew absolutely nothing about traditional archery. It wasn't like I had killed my fill of deer with a compound either. I had started bowhunting when I was twelve. I don't even really remember why I wanted to bow hunt or how the idea got into my head. I do remember wanting to learn to hunt. I had always been a boy who was lost in the woods or wading some nearby creek catching crawdads. I guess it was just a natural extension of my desire to be outside. I cut lawns and saved up $60. My dad, who knew nothing about archery, took me to a local pawn shop where I picked out an old Darton trailmaster compound with wood glass limbs. I thought I was Fred Bear himself with that bow in my hand. I learned to shoot that bow with fingers, that is, as soon as I was strong enough to pull it back. I worked and worked at it increasing my strength pull by pull. I poured over the pages of Bowhunter Magazine and Field and Stream for any tips and instruction I could find. This was 1988 and there was no internet to scour for information. There were no youtube videos or online forums. It wasn't long before I had somehow managed to teach myself a reasonable form and solid anchor point. I was drilling a cotton filled burlap sack my dad had purchased for me at Augusta Sporting Goods at 25 yards with ease. I wouldn't take my first deer with a bow until I was 19. It was a long drought. 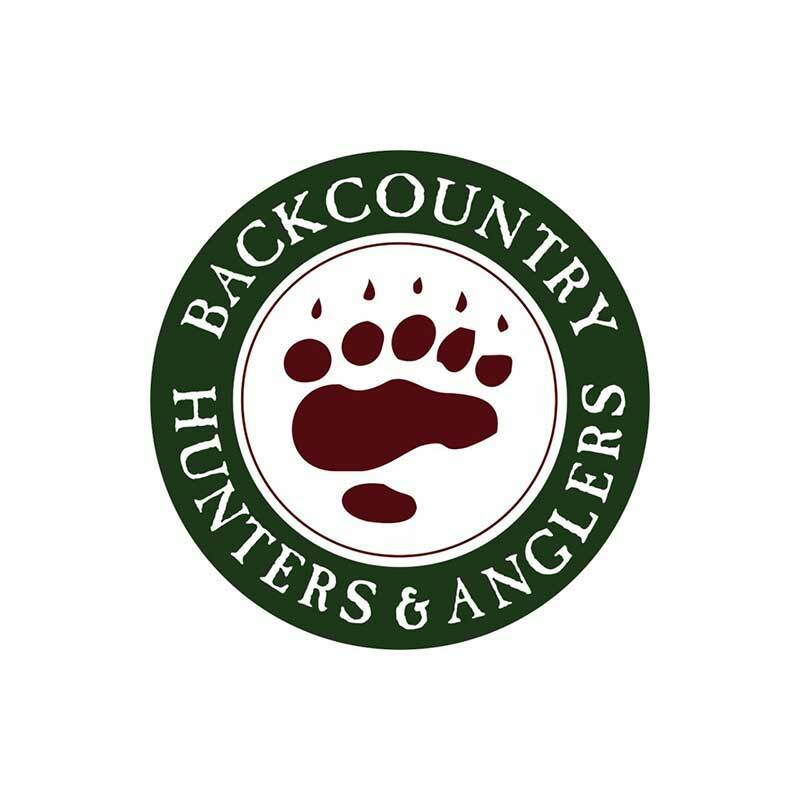 Hunting pressured public land and having no idea what I was doing made for a steep learning curve. For some reason I never quit. It just wasn't my nature really. I hunted with a rifle some during those years mostly with my high school friends. Only one of them bow hunted and he was as clueless as I was. We played football on friday nights and on saturdays we hunted. I made my way slowly across the shallow wet weather pond. The water was only ankle deep and I was headed to a willow tree growing at its edge on the far side. I was in Graduate school at the University of South Carolina and I had, had almost no time to hunt over the past couple of years. I had managed to get out to some pubic land over the holidays and had found several scrapes just along the edge of this wet weather pond. There was a 35 yard swath of land between it and the river and any deer traveling the river bottom had to pass through it. The willow had a low branch that made a perfect seat with lots of good cover around me. I settled in for what I imagined would be a long fruitless wait. I cradled an old martin hatfield takedown recurve in my lap. I had managed to get consistent with it out to 20 yards and I felt confident if a buck checked that scrape at 12 yards he was mine. I was startled out of my thoughts by the sound of a deer trotting right at me. He was coming right down the edge of the pond and I held my breath as he approached. He stopped at the scrape and began sniffing and pawing at the leaves. At 10-12 yards he was lager than life and I was afraid to blink. Suddenly, I noticed the moisture vapor from my breath floating right at the buck like a toxic cloud of death. The wind had shifted and the deer was now directly downwind of me. Instantly he snorted and stuck his head straight up on full alert. He scanned his surroundings for danger, the muscles in his shoulders rippling with fear. He looked dead away from me and when he did I drew and released. He was already in motion as the arrow arced towards his vitals. He ducked and spun in the direction he had come from as the arrow narrowly sailed over his back. He was gone. I sat motionless completely numb to what had just happened. Oddly all I could think about was getting back to columbia to tell my room mate, Rocky, about my incredible encounter. I had met Rocky Cooley while I was in Nurse Anesthetist school at USC. He was in the class behind me. I was graduating in May and my wife and I had put our house up for sale early and it had sold in two weeks time. She was moving back to live in North Augusta, SC while I still needed a place to crash until school was officially over. I had heard through some students that Rocky had a house and might be willing to rent a room to me on the cheap. We Immediately hit it off. We were both huge outdoorsman and it was like we had been friends all of our lives. Rocky was a bowhunter plain and simple. A good ole boy from Lagrange, Ga, he and I just simply saw the world the same way. Proof of this was in the fact that I hadn't even gotten the story completely out of my mouth when he said, "So when we going back?" We hatched a plan in short order. We would use my jon boat for an afternoon river assault next saturday. I settled in to my stand on one side of the wet weather pond and a text from Rocky confirmed he was also, "Up n good!" We had the pinch point covered on each end of the wet weather pond with about 100 yards separating us. The jon boat was beached at the rivers edge and we were both drunk with the possibility of hauling a deer out in it. My thoughts were broken by the sound of crunching leaves. The buck was back and heading right for me. I slowly stood and retrieved my recurve from its hook on the tree. The buck stopped at about 18 yards and was feeding on pin oak acorns and slightly quartering away. It was now or never. I drew slowly keeping my eye focused on a spot just behind his shoulder. The arrow passed just under the bucks chest and stuck into the ground. The buck startled but was unsure of what had happened. He stood still for a moment and then slowly walked right towards me. I fumbled with my quiver and got another arrow ready, never taking my eyes off of him. The deer passed behind my tree and when he was at 10 yards I drew. The angle was a little steep and I didn't take into account that my bottom limb might be in peril of striking the side of my stand. However, when i released it became very obvious. The arrow soared over the deer's back and he started off at a trot down towards Rocky. A few moments later I heard the tell tale sound of an arrow slamming into an animal. I reached Rocky just as he stepped out of his stand onto the ground. He said he wasn't sure about where he'd hit the deer but he felt like it was a good hit. We debated for a moment about backing out, but we both had to be back in columbia the next day for call shifts at the hospital as part of our training. We decided to take a quick look and assess the blood trail. There was blood every where. It called to us and drew us deeper and deeper into the woods like the song of some mythical siren. Somehow we knew better, but somehow we just couldn't help ourselves. We found several spots with large pools of blood where the deer had stopped. Surely we would find him at any moment. There was so much blood! Thats when we jumped him the first time. We waited about 30 minutes and picked up the trail and it wasn't long before we jumped him again. To make matters worse the blood trail was getting less all the time. Something wasn't right. This deer should be dead by now. We were a long way from the boat by then and we new were very close the national forrest boundary. We followed the trail up the side of a hill into waste deep grass and thats when the blood stopped. The ride home was a quiet one at first. We both knew we had made a mistake. What was worse we knew that deer was likely going pay the price for it. Rocky had lost a few deer in his time as bowhunter. This was my first. It felt awful. I could tell that Rocky knew what I was feeling. He told me stories of hunts gone by. We talked about the fact that we should have backed out, but we really hadn't had a choice with school and all. At the end of the day we had done all we could and it wasn't enough. It wasn't enough for either of us. Rocky paused and took a long deep breath and then in his thick south Georgia accent he said something I will never forget, " If you chop enough wood man, you gonna a splinter."